The data bus market is projected to grow from USD 15.70 Billion in 2016 to USD 19.47 Billion by 2021, at a CAGR of 4.41% during the forecast period. The objective of this study is to analyze, define, describe, and forecast the market on the basis of protocol, application, component, and region. The report also focuses on the competitive landscape of this market by profiling companies based on their financial position, product portfolio, growth strategies, and analyzing their core competencies and market share to anticipate the degree of competition prevailing in the market. 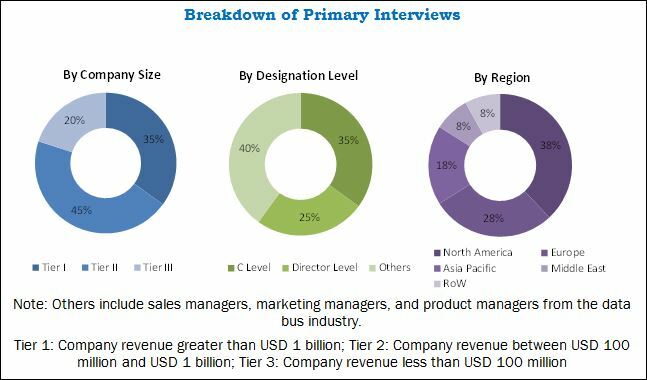 This report also tracks and analyzes competitive developments, such as partnership, mergers & acquisitions (M&A), new product developments, and research & development (R&D) activities in the global data bus market. The year 2015 has been considered as the base year, and the duration between 2016 and 2021 has been considered as the forecast period for this market study. The ecosystem of the data bus market comprises protocol, application, and component industries. The data bus value chain includes raw material manufactures, such as Optical Cable Corporation (U.S.), Sterlite Tech (India), among others. Key players operating in the market include TE connectivity (Switzerland), Amphenol Corporations (U.S.), Fujikura Ltd. (Japan), and Corning Inc. (U.S.). Acquisition and new product launches are the major strategies adopted by key players operational in the data bus market. Furthermore, products manufactured by these companies are used by firms, , such as Airbus (France), Boeing (U.S.), Volvo (Sweden), Boeing (U.S.), Newport News Shipbuilding (U.S.), Pipavav (India), and Volkswagen (Germany). This report will help data bus manufacturers, suppliers, distributers, and sub-component manufacturers to identify hot revenue pockets in this market. The data bus market is projected to grow from USD 15.70 Billion in 2016 to USD 19.47 Billion by 2021, at a CAGR of 4.41% during the forecast period. Intensive electrification in automotive, commercial aviation, and marine sectors, modernization of military aircraft, telematics, and need to reduce Swap specifications are the major factors, which are expected to drive the market globally. There is a positive trend towards adoption of AFDX/ARINC 664 and MIL-STD technologies by market leaders. China, India, Brazil, Russia, and Saudi Arabia are the key countries that are expected to witness an increase in demand for data bus. Based on component, the cables segment is expected to lead the data bus market during the forecast period. It is estimated to account for the largest share of the market due to technological advancements, and use of fiber optics over copper cables, and lightweight cables to save space and cost. North America is estimated to account for the largest share of the data bus market in 2016. The growth of the market in North America can be attributed to the growth of the electric car industry due to environmental regulations and green initiatives. Furthermore, the Asia-Pacific market is expected to grow at the highest rate. Rise in defense spending of countries in the Asia-Pacific region is expected to drive the data bus market during the forecast period. The U.S. and the U.K. are witnessing economic slowdown. The U.S. government has drastically reduced its defense spending. According to the U.S. DoD, in 2015, the country solely accounted for approximately USD 650 billion of the total defense spending. Besides the U.K. and the U.S., the European Union, which is recovering from economic crisis, is mulling over trimming its defense budget. In addition, the life cycle of a data bus varies from 35-45years, after which, a data bus is upgraded. Key players prefer replacing the data bus than upgrading it. Hence, the market for data bus remains stagnant for a long period, thereby restraining the growth of the data bus market. 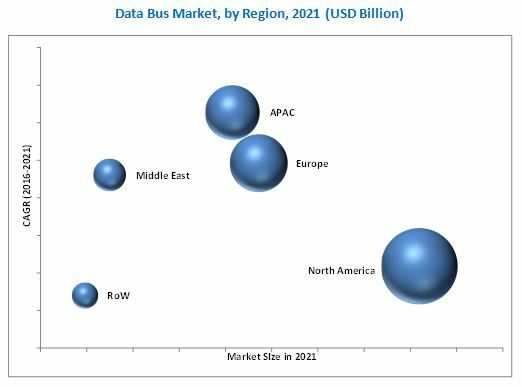 The data bus market is a diversified and competitive market with a large number of players. Key players in the market are TE Connectivity (Switzerland), Amphenol Corporation (U.S.), Fujikura Ltd. (Japan), Corning Inc. (U.S.)., and Rockwell Collins (U.S.), among others. TE Connectivity is the leading player in the data bus market. The company has presence in 20 countries of America, Asia-Pacific, Europe, the Middle East, and Africa. In 2015, the company’s transportation solutions business accounted for a share of approximately 40% of the data bus connectors market. The company focuses on carrying out innovations for each of its products that are launched in the market.